She faced rejection from 13 beverage manufacturers, 19 distributors, seven food technologists, Facebook and Instagram. Yet that didn't stop Natalie Moubarak – mum to two children under seven – from pursuing an 18-month journey into developing the first beverage of its kind in Australia. Now, just days after it has been developed, +hemp (plushemp.com.au) – Australia's first hemp water – has been quickly snapped up by a fast-growing list of recognised retailers. Natalie's against-the-odds journey highlights the determination and self-belief of a true mumpreneur. She spent her 20s working in the cut-throat real estate market. At 29, she learned how to face negative feedback when she turned a rundown shop in Sydney's Earlwood into an organic and vegan café. Residents told her Earlwood not the 'right' market for such a café and it was in the wrong street and would go under. Determined to prove them wrong, Natalie began making a profit in the third month and, wanting to spend more time with her young children, she sold it two years later for a 45 per cent profit. In 2016, Natalie began tracking the legislative journey for hemp-based foods. She wanted to be first-to-market with a high-quality natural hemp water, and personally banked on her belief that hemp foods would be legalised. Natalie knew that a hemp water would take off in Australia if it would contain high-quality Australian-grown hemp, and a natural process that would mix the oil with water. She visited multiple hemp farms across Western Australia, Queensland, Victoria and South Australia. She spoke with hemp industry experts, and eight food technologists to work out how to process hemp with water. She did market research with students. She met with manufacturers and bottlers. It would have been easier for Natalie to get the drinks made overseas – as only two Australian manufacturers were able to carry out reverse-osmosis water filtration together with aseptic technology. She carried out paid trial testing over 12 months and turned her kitchen into a lab. She trademarked the brand name. She put $100,000 of her own money into the entire journey. Many doors closed for Natalie during this period, and friends and family told her she was risking too much money and time into a product that might not take off. Hemp was legalised as a food in Australia in November 2017 after a major review by Food Standards Australia New Zealand. It is a strain of the cannabis plant, but contains negligible traces of tetrahydrocannabinol, found in cannabis. Natalie worked hard to source a hemp oil that had nil levels of tetrahydrocannabinol. This month, in selling her first product run, Natalie cold-called distributors – many of which declined to meet with her – and more than 50 food-service venues. While Facebook and Instagram wouldn't let her advertise, her organic posts were shared rapidly and some cafes and fitness centres in Sydney, Melbourne and Queensland – and even the US – asked to stock +hemp. Natalie's luck kicked in when she made brought samples to a Sydney petrol station. A rep from a major beverage distributor was there, and organised a meeting with his team a few days later – where they accepted +hemp on the spot. That was two weeks ago. Today, +hemp is so far available in 46 retailers, including selected IGAs, BPs and Caltex service stations. Natalie has plans to release new flavours later this year, and to expand globally. Review: +hemp is a hydrating and refreshing blend with a hint of mint that will leave you feeling healthy inside and out. Full of #health benefits including omega-3 and omega-6 essential acids this drink is formulated using only natural ingredients and whether you choose to drink from the bottle (it's better chilled) or add +hemp to your tasty smoothies, you'll be impressed with the properties. Natalie Moubarak: +hemp is Australia's first true hemp water. 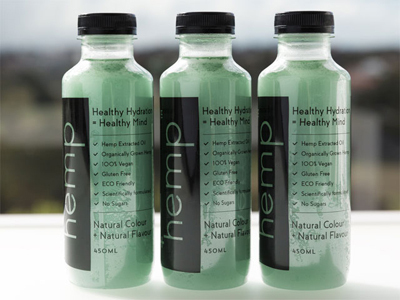 It is a hemp-based beverage, different to hemp-infused water that has already been on the market. It is a scientifically-formulated beverage that combines water and hemp oil, in addition to other natural ingredients. The hemp that is used in the beverage is high-quality Australian-grown organic hemp. This gives +hemp its natural nutty flavor with a citrus burst from the other natural flavours. Question: What inspired the creation of +hemp? Natalie Moubarak: I've had psoriasis for more than 15 years and there was no cure except for a few steroid creams to soothe the pain temporarily. I did a lot of research on hemp and its benefits and came up with a concoction to mix hemp and moisturising cream, which worked better than any other prescribed creams. This is how my interest in the legislative process of hemp started – I wanted to track its progress and the legislation of hemp-based foods as I wanted to be the first-to-market with a high-quality hemp water. I personally banked that hemp would soon be legalised as a food so I underwent this 18-month journey to create +hemp. Question: Can you talk us through the ingredients in +hemp? Natalie Moubarak: +hemp is scientifically formulated with ingredients including water, hemp oil, natural flavor, xanthan gum, and natural colour (chlorophyll). We've also added vitamin C into the beverage for additional health benefits. The hemp oil used in +hemp is cold-pressed edible oil derived from high-quality Australian-grown organic hemp seeds. +hemp is tetrahydrocannabinol free, which means it has no psychoactive or hallucinogenic effects, and it comes from the seed of certain varieties of the Cannabis sativa plant. Hemp was legalised as a food in Australia – in its seed form only – in November 2017. The hemp oil we use is high in omega-3 and omega-6 essential acids. Other nutritional benefits include gamma linolenic acid, antioxidants and amino acid. Question: How did these ingredients contribute to your success? Natalie Moubarak: With +hemp, I made sure to use a good and exclusive supplier that provides me with high quality food grade hemp seed oil. By focusing on quality, I'm able to put out a product that I'm confident in and comfortable to promote to Aussies. Question: Which well-known retailers currently stock +hemp? 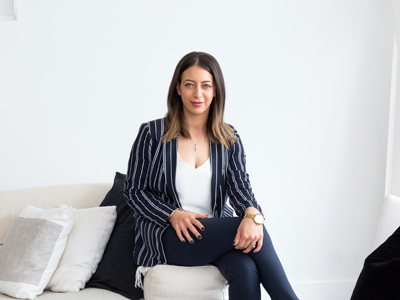 Natalie Moubarak: +hemp is currently available in 65 retailers – and growing – including selected IGAs, BPs service stations, cafes and fitness centres in Sydney, South Australia and Queensland. Businesses in the US have even asked to stock the product. Question: You balance your business with two children under seven; what advice do you have for other parents who have their own business? Natalie Moubarak: The biggest advice I can offer other parents is to get your kids and family involved and never give up. It's important to have a work/life balance, and for me, I found that during my initial business journey, this is what worked best for me. I was able to spend time with my two children while out and about and they had lots of fun coming along and getting involved – from coming with me to hemp farms around Australia which educated them on the process and benefits, to having them help pack boxes and help with customers at shops – I wanted them to be involved with me the whole way. It's also important to understand that there will be a lot of hard work and challenges but keep persisting and don't give up. Kids should never be an excuse to stop you from running your own business – they should get involved. Question: What has been the biggest challenge you've had to overcome since starting your own business? Natalie Moubarak: Every step has been challenging but the challenges that I had to overcome have pushed me to work harder and do better, which has ultimately led to my success. I didn't want to succumb to the typical Lebanese-Australian girl stereotype who is a stay-at-home mum – instead, I want to work hard, take risks and set a good example for my kids. I'm very lucky to have a strong support system – my parents, my husband and my brothers and sisters – who all kept motivating me during moments where I felt like giving up. They kept reminding me what's at stake and to work towards developing Australia's first hemp water. In developing +hemp, I was also told that I needed to add some sugar and preservatives to make my hemp water last longer and taste better for it to work in the commercial market, but this isn't what I wanted to do – I wanted to keep it all natural. After a lot of research and work with a great food technologist, we made our formula work. I managed to put an all-natural hemp-based drink on the market despite being rejected by many distributors, so being persistent really does pay off. Question: What's next for +hemp? Natalie Moubarak: I'm planning to release new flavours later this year and eventually expand the business globally. I'm also looking to stock within more retailers in Australia to give Aussies an accessible hemp beverage with lots of benefits.